« What if the NFL Was Run Like the Government School System? What nation is a role model for economic reformers? I’ve certainly cited Hong Kong as an example, but I’ve also explained that we can learn lessons – at least on certain issues – from nations such as Sweden, Australia, Canada, and the Baltics. Today, let’s talk about the curious case of Denmark, which is a rather schizophrenic nation (at least when it comes to public policy). According to Economic Freedom of the World, it has the 15th-freest economy in the world, out of 141 nations that get graded. This is a relatively good score, but what makes Denmark rather interesting is that it is the combination of two things that normally don’t go together. The first item is a free market, laissez-faire economy. * Denmark is the 5th best nation in the world for protecting property rights and maintaining a sound legal structure. * Denmark is the 11th best nation in the world for avoiding over-regulation of credit, labor, and business. * Denmark is the 24th best nation in the world for sound money. * Denmark is the 25th best nation in the world for freedom to trade across borders. * Because very few nations have consistently good scores in all these categories, Denmark ranks 4th among all nations when you combine these important measures of a free market economy, surpassed only by Hong Kong, Singapore, and New Zealand. In other words, Denmark is about as laissez-faire as a nation can be, and it definitely ranks above the United States. The second item is bad fiscal policy, featuring high tax rates and a bloated welfare state. * Denmark ranks 113th for fiscal policy in the Economic Freedom of the World report. * With a tax burden that amounts to more than 54 percent of GDP, it is second only to Norway as the highest-taxed developed nation in the world. * The burden of government spending is more than 58 percent of GDP, the highest of all industrialized nations. * Denmark impose the highest income tax rate in the developed work, a punitive rate of more than 59 percent. * Astoundingly, that top tax rate takes effect when income reaches about $45,000. These factoids, which come from the OECD fiscal database and the OECD tax database, show that Denmark is about as statist as a nation can be. So what can we learn from Denmark, especially given this Dr. Jekyll and Mr. Hyde approach to public policy? Probably a lot, but I want to focus on two lessons. 1. A nation with a big welfare state needs to compensate with ultra-free market policies in other areas if it wants economic growth. Denmark may not be enjoying strong economic performance, but it does reasonably well, particularly compared to some other European nations. The lesson to learn is that a nation that is screwing up on one policy – such as Denmark with fiscal policy – needs to be very careful not to allow mistakes in other areas. 2. An even more important lesson to understand is that Denmark waited until it became a rich nation before it adopted the welfare state. Indeed, this is the story of just about every North American and Western European nation. The burden of government spending didn’t explode until the 1960s. This is important because there is a relationship in the academic literature, known as Wagner’s Law, which revolves around the tendency for rich nations to have big governments. Some people naively conclude that this means big governments lead to more prosperity. But this puts the cart before the horse. 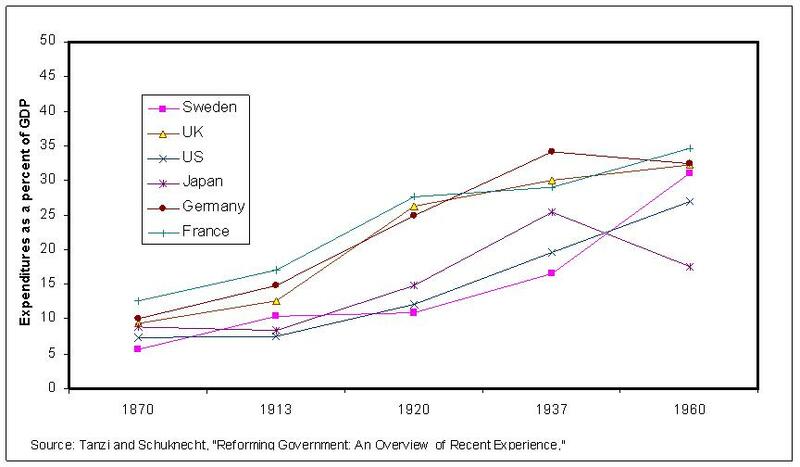 Denmark and other western nations became rich first, and then government expanded. This chart from two European economists shows that even as late as 1960, government spending in six major western nations averaged only about 25 percent of GDP. That’s far lower than the United States today (getting close to 40 percent) and much lower than the burden of the public sector in many European nations (in some cases more than 50 percent of GDP). Most importantly, government spending consumed only about 10-12 percent of GDP prior to World War I, and this was the period when the western world was transforming from agricultural poverty to middle-class prosperity. Unfortunately, the big expansion of the welfare state in the 1960s (which was made possible by the money machine known as the value-added tax) has slowed growth in western nations. The only silver lining to that dark cloud is that at least these nations became relatively rich before the burden of the public sector became too large. This is why, whenever I’m speaking in a developing nation or a transition economy, I explain that they should copy nations such as Denmark and the United States. But they should copy our policies from 100 years ago, when we became rich countries. Copying our policies today, on the other hand, is a recipe for tepid growth in the short run and Greek-style fiscal chaos in the long run. So wake up Western People. Wake up American voter! You are living in a bubble. You don’t realize that the rest of the world has caught up with you and you can hardly afford to abandon the principles that brought you to the top in the first place and, even more perniciously, adopt the very policies of your once upon a time failed competitors. Look at your future. Look at the employee roster at the typical Silicon Valley world class company: Li, Wang, Gupta, Chang, Pradeep, Prasad, Chen, Sharma, Revankar…. Then, for each one of those you see employed here in the US, there are 4 more working in foreign lands with American capital and then 40 more who have completely bypassed American business and industry and are working in foreign lands with foreign capital to compete and supplant American industry on the world stage. So what is going to save you? What is the plan? HopeNChange? That is, the petty comforting government programs that we voted for ourselves which are designed to make us more comfortable by encouraging indolence and insulating us from the consequences of mediocrity while at the same time putting extra burdens on those who can still, for the time being, outcompete the rising competence outside our borders? Pathetic! You are waging war against the incentives of those who are pivotal to your maintaining the 6x world average prosperity you have been accustomed to and take for granted. Meanwhile you rest your hopes to compensating for the lost incentives to “our central planning will be better than theirs” Pathetic indeed! But refraining from this immediately comforting but self-destructive voter behavior is unnatural – goes against human nature. That is why a winning recipe to prosperity is so obvious, yet so difficult to implement. The biggest change of our times is MOBILITY. Thus, under the competition enabled by mobility, even dictatorships and once reprehensible regimes have been forced to offer somewhat fertile and competitive environments for people with world competence. This is why today many already feel freer in Dubai than in France or Denmark. While this leads to partial liberalization of once reprehensible regimes, still, if western voters do not resist their inner human temptation and fail to offer a hospitable environment to talent and/or hard work, dictatorships may still start outperforming democracies. And that would be a terrible outcome for liberty — even for western world’s relative poor who still today enjoy prosperity levels 2-3x world average. Is Denmark’s growth anything comparable to the average annual world growth trendline of 4-5%? If the answer is no, then it is mathematically on a path to economic decline, together with the rest of the western world. Three billion people in the developed world have finally woken up by starting to mimic the individualism of the west — and are thus finally placing an incredible pressure on western worldwide competitiveness. Feeling the stress from a now competitive mass of humanity three times its size, the western world voter reacts! How? Of course, by adopting the very policies of mandatory collectivism that once kept the rest of the world in low productivity quagmire! An asinine path to certain economic extinction, or, more specifically, economic convergence to the worldwide average. Voters, of course, suspect that it will not work as there seems to be something akin to a perpetual motion machine in this general concept. But heck! It’s an irresistible proposition, an irresistible shortcut to maintaining 6x average worldwide prosperity through legislative gimmicks. So yes, heck let’s try it and if it does not work we can always roll back government later and go back to the American mentality of self determination and self reliance that got us to be most prosperous nation in the world in the first place. It’s all reversible, isn’t it? That been said, I’d be happy in a world where even a mere 10% of the planet surface were occupied by countries such as Hong Kongs and Denmarks to choose from, coupled with permissive immigration policies. Statists and proponents of individual freedom could then choose their respective paradises.